Whether it's software, a cell phone, or a refrigerator, your customer wants - no, expects - your product to be easy to use. 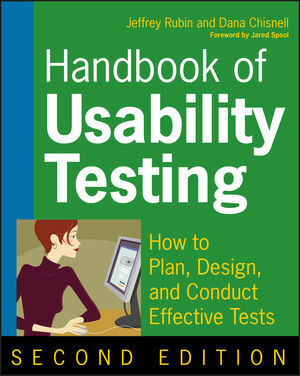 This fully revised handbook provides clear, step-by-step guidelines to help you test your product for usability. Completely updated with current industry best practices, it can give you that all-important marketplace advantage: products that perform the way users expect. You'll learn to recognize factors that limit usability, decide where testing should occur, set up a test plan to assess goals for your product's usability, and more. Jeffrey Rubin, author of the first edition of this book, has more than 30 years of experience as a human factors and usability research consultant and lecturer. A pioneer in the field of usability testing, he has consulted for leading companies worldwide. Dana Chisnell is an independent user researcher and usability consultant. She has done usability, user interface design, and technical communications consulting and development since 1982. Click the HTTP or FTP hyperlink after each file description to download that file.